What's the Difference Between a PsyD and a PhD? A doctoral degree isn’t required to provide therapy, and many qualified mental health professionals who work with clients don’t have one. But some professionals in the field of psychology further their studies in research, professional psychology, or both by obtaining a doctoral degree. Even in terms of psychology, doctoral degrees aren’t all the same and differ in a few key ways. In brief terms, people with a PsyD (Doctor of Psychology) degree generally use their psychology training to work with people seeking therapy. People who hold PhD (Doctor of Philosophy) degrees typically teach, conduct research, or consult professionally in mental health fields. Whether you’re narrowing down a career path or trying to make sense of a potential therapist’s credentials, it can help to know more about what distinguishes a PsyD from a PhD. Completing any doctoral degree involves conducting research, but the research focus will usually depend on the type of degree being pursued. For example, students in a research doctorate (PhD) program will work toward the development and discovery of new knowledge and theories. This research work is helpful in preparation for educational careers or work with other researchers conducting experimental trials and studies. Students in a professional doctorate (PsyD) program work to apply existing research to better understand (and attempt to solve) issues in their field of study. This application may lead to the development of new ideas, but original research is not the primary goal. This applied research work helps students prepare for careers as mental health clinicians. In terms of psychology, people holding a PhD are more likely to have careers teaching psychology or working with other researchers to develop experimental trials and studies looking at mental health issues and treatment. People who have a PsyD are more likely to become mental health clinicians. But this isn’t always the case. Some people with PhDs may choose to apply specialized knowledge and research to a clinical setting and work with people directly. Similarly, some people holding a PsyD may enter a research-based field to learn more about the contributing factors in mental health concerns and evidence for or against certain treatments. Both research and professional doctorate programs can lead to success in either area. Before 1970, a PhD was the only option for students who wanted to get a doctoral degree in a psychology field. Today, mental health professionals interested in research, clinical trials, or psychology education may choose to get a PhD. Before 1970, a PhD was the only option for students who wanted to get a doctoral degree in a psychology field. Some professionals with a PhD will still provide therapy. For example, a therapist who treats a certain mental health issue may have obtained a PhD conducting research on the issue and potential treatments in order to provide the best care. In other words, a therapist whose PhD research focused on a particular mental health issue or type of therapy may provide more specialized treatment than a therapist who treats a range of concerns. A master’s degree is usually needed to enter a PhD program, though a bachelor’s degree might be accepted in programs that allow students to complete a master’s and doctoral degree at the same time. Because space is limited in PhD programs, the acceptance rate is generally 15% at most. To be accepted, good GRE scores, a high GPA, and strong letters of recommendation are generally necessary. The length of a PhD program varies, but between 5 and 8 years is fairly standard. The cost may be quite high, depending on the school, but many schools offer tuition waivers and/or stipends to students who teach or assist with research. A dissertation is required for graduation. Students must become licensed after graduation. PsyD programs are designed for students who want to develop their knowledge of psychology research and apply it when providing therapy. While it’s not necessary to have a PsyD in order to work with clients, some people may prefer to further their education and become licensed psychologists before establishing a therapy practice. Having a doctorate can mean an increase in income and a wider range of job opportunities to choose from. Although PsyD programs are more focused on clinical care than on research, mental health professionals with a PsyD are required to apply research in their studies. Professionals who have a PsyD may have more specialized knowledge than professionals with only a master’s degree. This could be important to some people seeking help for a rare or difficult-to-treat mental health issue. As with a PhD program, a master’s degree may be required to enter a PsyD program. Acceptance rates for PsyD programs tend to be higher than those for PhD programs. About 40% of people applying are accepted. On average, a PsyD program takes slightly less time to complete than a PhD program. Students who want to enter clinical practice may find a PsyD program a better fit. However, the overall cost of getting a PsyD may be higher since tuition assistance is usually not offered. A dissertation or project is required for graduation, and students must also become licensed after graduation. Should I Pursue a PhD or a PsyD? 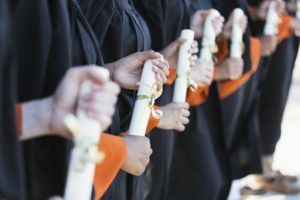 Some people may consider a PhD the highest degree available in psychology or believe a PhD is superior to other psychology degrees, but this isn’t necessarily the case. What sets the two degrees apart is the skill sets they’re most likely to develop. If you’re trying to decide between degree programs, consider what direction you’d like your career path to take. Do you want to teach? Does research interest you? A PhD program may be the better fit. If you already know you want to work with clients, a PsyD may be ideal. A PhD and PsyD differ, but they are still similar degrees. They both help psychology students develop research skills and knowledge they can apply to education or clinical practice. If you are a recent graduate and starting your career as a mental health professional, click here to learn how GoodTherapy can help you start connecting with referrals and the resources you need to jump-start your career.